KEANU DAVIS didn't like going to school during his freshman year at Simon Gratz High School, and the numbers prove it: He was absent 30 times and arrived late 80 more times, he said yesterday. Davis, now a college-bound senior, decided to stay enrolled at the Nicetown school the following year after Mastery Charter Schools took control of the district school. It took a few months, but Davis noticed a change. Other students started attending Gratz with regularity - as did he. "My whole viewpoint of school and of life has been changed because of Mastery," said Davis, 19, who plans to attend Susquehanna University this fall. "I really didn't care about school or anything [before]. I slept in class." That's not the case anymore. 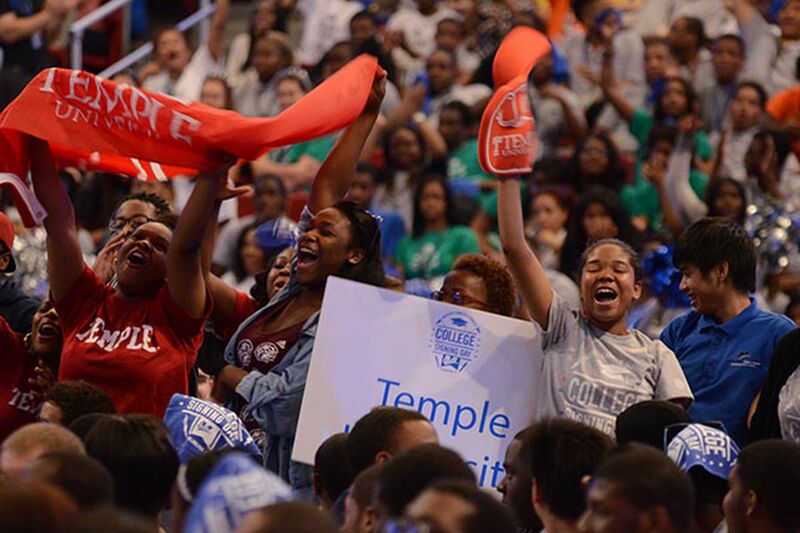 Davis, along with 497 fellow Mastery seniors from five high schools, announced their post-high-school plans at Temple University's Liacouras Center during the charter operator's second annual College Signing Day, a lively ceremony celebrating the accomplishments of the senior class. Their names and school selections were flashed on electronic signs inside the center. And at the end of the program, the students stood up and cheered as each school was called. Mastery Charter CEO Scott Gordon addressed the crowd of about 5,000. The charter organization, he said, was born "of a sense of hope and a belief in you." "Your teachers, your family, your community believes in you, has hope for you," he said. "So we organize this day of course to celebrate, but also to do something else. We want you to recognize and feel the power that you have - there are 460 Mastery graduates going off to college." The crowd, which included family members and Mastery students not in 12th grade, cheered. The seniors will enroll in 98 institutions and are the recipients of $21 million in scholarships, up $7 million from last year's class. About 62 percent, 308 students, will attend a four-year school, while 28 percent are headed to a two-year college. Seven percent, about 35 students, plan to join a program such as the Job Corps or the military. Three percent of Mastery students, or 14, will be placed through the Office of Vocational Rehabilitation. Davis, who has gotten consistent A's since his sophomore year, said he hopes to study neuroscience and business, and eventually to become an FBI agent. He is one of 32 Mastery seniors named an Affinity Scholar, a Mastery program that partners with eight schools, including Susquehanna, to minimize tuition costs.